When it comes to home security, there are many different kinds of options to choose from. However, for those who are running a tight budget and yet would like to have a semblance of peace of mind, how about checking out the $19.99 WyzeCam from Wyze Labs? This is a smart home camera that is extremely affordable, which means no home should go without a security camera of some sort, ever. After all, installing a few of these to strategically capture different areas of your home would not cost a bomb, and since each WyzeCam comes with an adhesive-equipped mounting bracket, this means you do not have to worry about drilling holes into your walls. 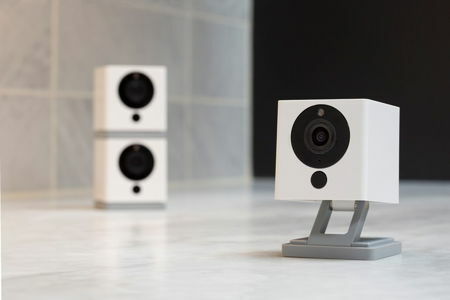 The WyzeCam will be a full featured wireless Full HD smart home camera, and we love the fact that it comes with 14 days of free rolling cloud storage. The 1080p Full HD camera boasts of 2.8mm focal length, a 110º wide angle lens, a 1/2.7″ CMOS sensor and 8x digital zoom capability. When it becomes dark, fret not. There is a night vision mode which delivers F2.0 aperture, an IR-CUT filter, and a pair of 850nm infrared LEDs to get the job done for everything it sees within a 30 feet radius. In addition, there is two-way audio that is enabled using the integrated speaker and microphone. Whenever you are not around the home, the built-in motion and sound detection capability of the WyzeCam will send you real-time alerts through push notifications to a designated smartphone. In addition, there is more than meets the eye with the WyzeCam, since it sports smart sound recognition that is able to figure out the unique sound patterns of smoke alarms as well as CO monitors so that you can be alerted to such specific emergencies.